Next to Turnip Chips, there also appear to be Parsnip Chips. Parsnip is a root type vegetable that looks like a white carrot. Carrots and parsnip are actually closely related, though parsnip tastes quite stronger. 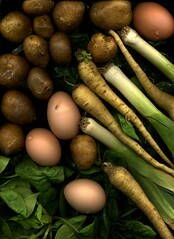 Parsnips were eaten like potatoes nowadays, before the potato was discovered as food.